Tonight's appearance on the Rev and the Vet Radio Show certainly got interesting. Everything went well for one hour and forty minutes. We were discussing being prepared for an end of the world scenario when the engineer's sound board when dead and the entire radio station went off of the air. The lights were still on in the building and the "on air" light was still flashing. Twenty minutes later, when the show was officially over, we were still off of the air! It was a strange occurrence. Aware that I chose space weather that brought with it EMP devastation as my "end all" in Superflare: The Fortunate Ones, a friend of mine who was listening texted me and asked if an EMP had hit. Thankfully that wasn't it. Tonight I had a wonderful time on a return visit to the Rev and the Vet Radio Show. It aired live on WGSO 990 AM in New Orleans, Louisiana. Deb Matthes from Washington State and my fellow survivalist, Mr. Raymond Jones, from Mississippi were on the phone enriching the conversation. It was a fun night talking about prepping and surviving, both on and off of the air. After the show, the hosts and I went eat supper and talked late into the night. We could have talked for days! I'm looking forward to going back for round three, scheduled for May 3rd, 2018. You can call in an ask questions if you'd like. Check my events page. 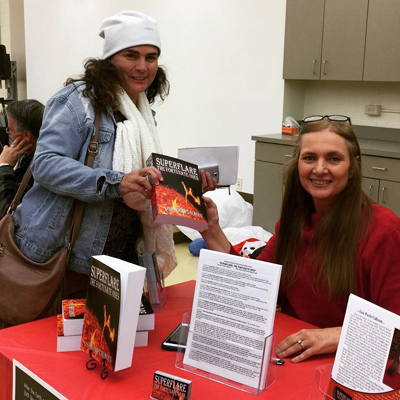 I took a few dozen copies of Superflare: The Fortunate Ones over to the Ouachita Parish Library for a book signing and couldn't get out of my SUV due to bad weather. Tornadoes were touching down around the area and there were hail and a tremendous amount of rain with local flooding. The books and I finally made it inside and I had an enjoyable time at the small, but intimate gathering. Here's a picture of Leslie Calhoun of the Ouachita Parish Library and me with the copy of the book that belongs to the library. Picture credit Lauren Cunningham. Thank you, ladies. I had a good time. I've applied for the Library of Congress Control number for the book I've written with my granddaughter. This children's book, "The Lost Lucky Horseshoe" is truly a family affair. The story line was the brainchild of my then seven year old granddaughter Victoria. The book is illustrated by my great niece Michelle, a high school student, and it's edited by my "niece-in-law" Patsy, our family English guru. This will be the first children's book I publish. One of the things required for a book to end up in a library is a Library of Congress Control Number, known in the industry as a LCCN. 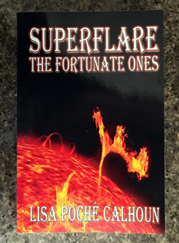 I paid CreateSpace to get my LCCN for Superflare: The Fortunate Ones. Now that I'm needing one for the book I've written with my granddaughter, Victoria, I found out that they no longer offer that service. Fast forward through a lot of research --- I find out it's not going to be all that easy. Publishers can apply for them, but it's not so simple for the rest of us. Finally, I applied to the Library of Congress to be recognized as a publisher and I was accepted into their Preassigned Control Number program. It was a rather difficult application process because I had no idea how to fill it out. That took more research. Today I was accepted into the program. How exciting! Success! I received a proof of the newly reformatted version of Superflare: The Fortunate Ones from Ingram today. This is my first time laying eyes on it. It's sleeker and less intimidating than it was in its original format. It's amazing what lowering the page count by sixty-two pages will do. You're only seeing this view of it because the spine and the back need a little tweaking. I think the front is perfect! I also know of one typo that still remains on this interior file, thanks to my great nephew Chandler. I'm in the process of reading it again in a last ditch attempt to ferret out any other typos before this book makes it into brick-and-mortar stores. The work never ends, but I've learned so much through this process. I have so much else to do, but this morning I found myself reading The Autobiography of Benjamin Franklin instead. I was captivated when I came upon the area where he was talking about his father. He said he was very well respected in the community, a peacemaker and wise. 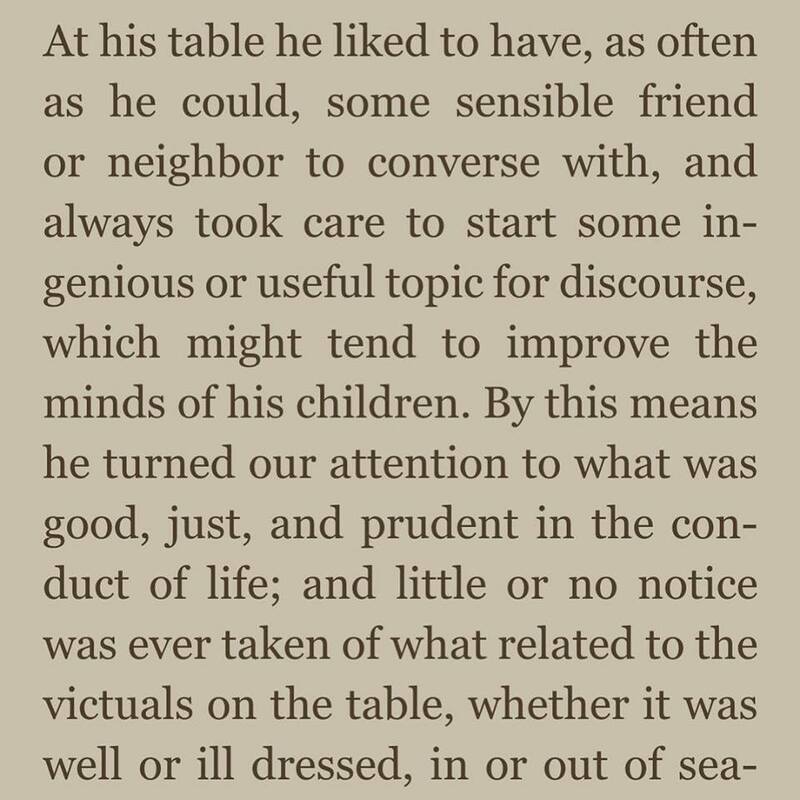 When I saw the following passage, I knew I had to share it with you because my father and Ben Franklin's father were very similar people. I learned a lot at my father's table. 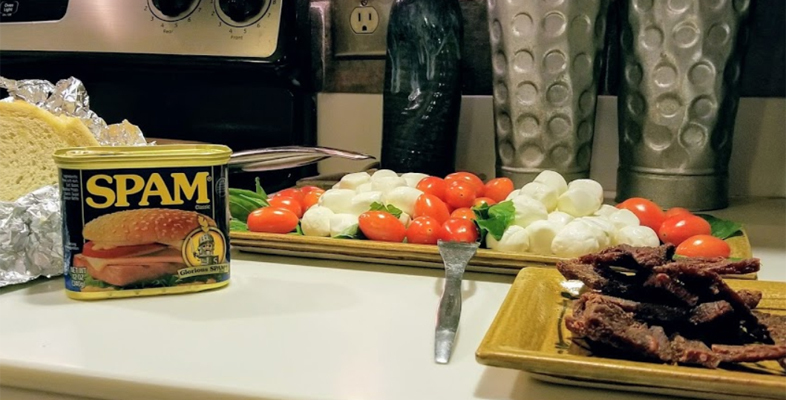 Re: "no notice ... of the victuals on the table..." My mother's table was more important to her and the food served upon it was always delicious, after all, we're a Cajun family. ;) It might have also had that times were not as hard when I was coming up as it was in the early 1700's for Ben Franklin. We were both the youngest child of the family, me the eighth born and he the eighteenth born! That might have had something to do with it, also. Over the last forty-eight hours Superflare: The Fortunate Ones has received three reviews, all five-stars. While I appreciate all reviews, I like that more and more men are reading this book, and they're liking it, too. I've been working with a formatter to reduce the page count for Superflare: The Fortunate Ones in an effort to release the novel in hardcover. While I've succeeded at lowering the page count from 686 to 624, and tweaking the cover since the spine is now smaller, I won't be able to release the book as a hardcover at this time. Even with sixty-two pages removed, the price would have to be upped to compensate for the cost of the hardcover. This is an expensive industry and there's a lot of hands in the till. I'll put this back on my wish list and wait for the right time. The new formatting is beautiful and elegant. I'm quite tickled with it. Before long the prints of the novel will be available with this formatting in paperback. The Just for Fun book club of Athol, Idaho took me up on my book club special offer and ordered six signed first edition copies of Superflare: The Fortunate Ones. Last week I sent out the books, each with its own bookmark, and four more bookmarks for the club members that had already purchased their books to read. Today only four books showed up in Athol, two of them damaged, with four bookmarks. So far, all the US Postal Service has been able to tell me is that it looks like the package had a rough time. I'd have to agree with that. There's no word about who ended up with two copies of the novel and six bookmarks. Even when items are damaged they're sent on with an explanation, but these were not. The club members have been sweet about the ordeal and I've rushed replacement copies to them. I'm looking forward to our Skype visit, (see the book club special offer.) The first picture below was taken before they were completely packaged here. The remainder are pictures the recipient sent to me. No bueno. The Bookies Book Club from Green, Ohio had their discussion of Superflare: The Fortunate Ones this evening and I was there with them via Skype. I thoroughly enjoyed myself and I think they had a good time having the author at the discussion with them. Pictured below are some of the book-related food selections they had at the book club meeting. I couldn't eat it, but I loved it, nonetheless! You can now find me and Superflare: The Fortunate Ones together on Goodreads. Please visit my author's page there and click "follow author." I'd appreciate it. If you're a reader and you haven't checked out Goodreads yet, do so. You'll probably like it. 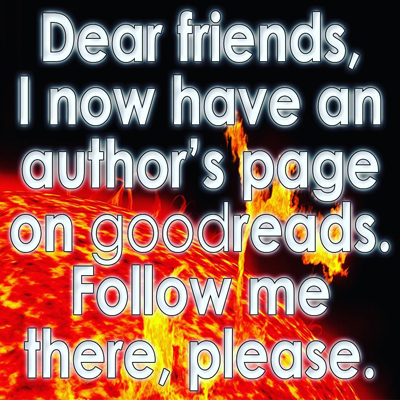 I also have a link to Goodreads on my social media webpage. I was absolutely moved to tears when I laid my eyes on this. 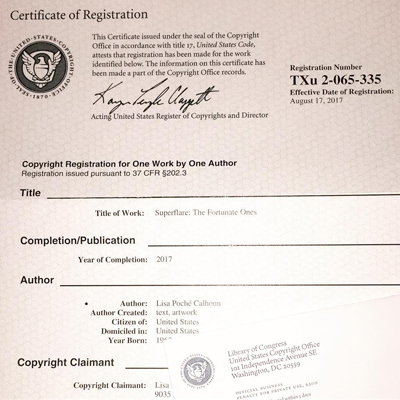 It's the copyright certificate for Superflare: The Fortunate Ones issued by the U.S. Copyright Office of the Library of Congress. I've worked long and hard for this and to hold it in my hand was moving. 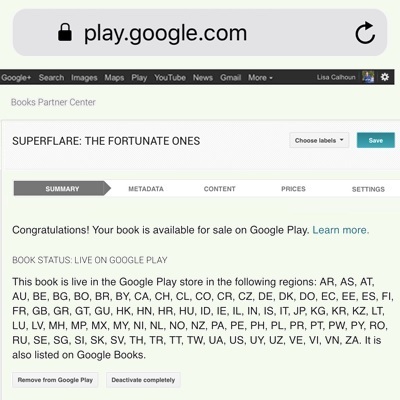 Superflare: The Fortunate Ones has been published with the final major e-book retailer on my list, Google Play. The platform distributes e-books to an astounding number of countries across the world. If I counted correctly, there's seventy-nine countries listed on this notification. Wow. That good news leads me to this lovely little tidbit. Superflare: The Fortunate Ones is now available from all of the online retailers listed below. Each of the logos is a functional link below that will bring you to my novel on the respective platform. I'm reading the first "London Carter" novel, "James 516," by B.J. Bourg. It's captivating. Update: My my, B.J. does a good job writing! I've never read crime fiction before and he's sucked me into the book and the series. As I write this, I'm on book 5 of 6....and I know I'll read the rest and I'm already sad there's no seventh book. There's a lot of twists and turns and you think you have an idea where it's taking you - but you're wrong - well, I've been wrong. The books are great quick reads. In book five, I finally knew where this was headed (I'm only about 40% in at this point) and it has me in total suspense! I know his characters well enough now to have an idea what to expect, but I know better than to think I know how this will end up. I'm getting back to work so I can't sit down and read as much as I'd like. I'll update you on the series when I'm finished reading it. You can find B.J. 's books on his website, https://bjbourg.com. I recommend the London Carter series. I think I've found a new genre to enjoy reading. I've got a fun idea for me and any of the book clubs out there that want to read my novel, Superflare: The Fortunate Ones. I have some first edition print copies of my novel that I'm willing to sell to book clubs at a reduced price and I’ll join your follow-up meeting to discuss the novel via Skype, schedule permitting. To check out the details click here. The New Year has been a solemn one for my family. My elderly brother-in-law Ted came down with influenza a couple of days after Christmas. Too frail to bounce back from it, he passed away early this morning. He was my dear husband's only sibling and he'll be missed. I'm going to take a bit more time off to be with my family. I'm taking a break for a while to be with my family throughout the holidays. We have a lot of functions spread over the next three weeks including a Golden Anniversary celebration for my sister Susan and her husband Wayne. They've had a long, wonderful marriage. Wayne is like a brother to me - he's been part of my family my whole life. 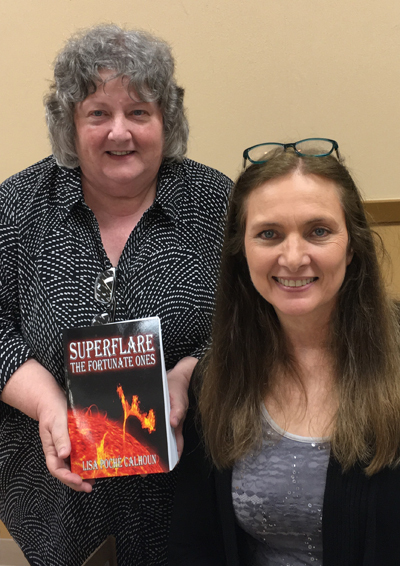 I brought some boxes of Superflare: The Fortunate Ones to Thibodeaux, Louisiana and took part in the Lafourche Parish Public Library's 2nd Annual Louisiana Authors Book Fair. It was super cold for Louisiana, we even had snow on the ground, and a sight we're unaccustomed to. I had to drive many miles out of my way to find an un-iced bridge to cross the Mississippi River. The effort was worth it. My first sale of the day was to this dear lady, Bronwyn from Australia, and I got to meet fellow authors, including B.J. Bourg, a crime fiction writer, and his lovely wife Amanda. We hit it off and I believe it's one of those friendships that will last. Oh my goodness, what an experience I had tonight! I was the guest on the Rev and the Vet radio talk show on WGSO 990 am. 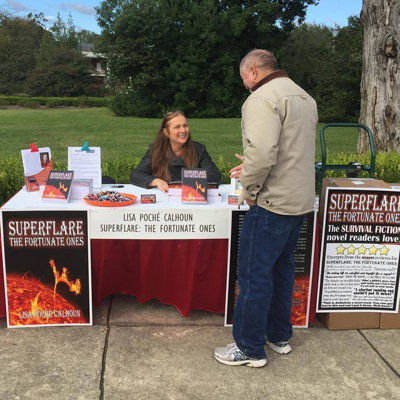 For an hour and fifteen minutes I was able to talk to Reverend Tony Talavera and take calls from listeners/readers about Superflare: The Fortunate Ones and the lifestyle portrayed in the novel. Listening to a tape of the show, I can hear a little trepidation in my voice at first, but then I was good to go. Overall, it was a great first time out (I've never been on the radio before) and I'm pleased with it. I do have some things to work on. I come on at 45:40 in the show. Today was certainly interesting. 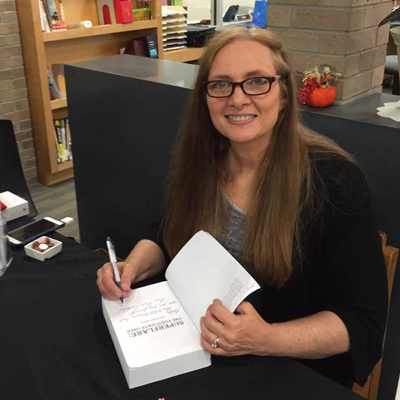 I had another book signing, this time at the Jones Creek branch of the East Baton Rouge Parish Library. When I walked into the room, it was set up with chairs for an audience. I've never given a talk about it to a crowd before, but it went okay, especially when you consider I wasn't prepared to speak to begin with. Life with Superflare: The Fortunate Ones is an adventure for sure! When I checked my Amazon reviews this morning I saw Superflare: The Fortunate Ones at the top of the page with this neat little "Best Seller" tag. Below is a snip from a screen shot. It's a long way from where I expect this book to eventually go, but it's certainly a step in the right direction. 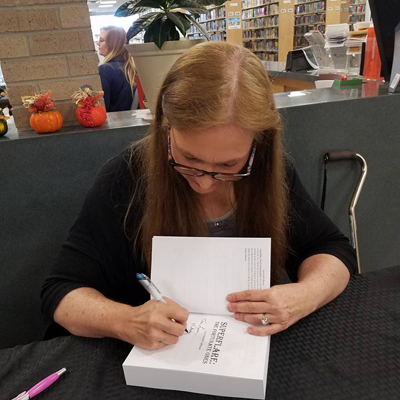 I had a wonderful day at my book signing that took place inside the first library I ever stepped foot in - the Lutcher branch of the St. James Parish Library. The crowd was amazing! Family showed up, I saw old friends, loved ones that are gifts from my first marriage, teachers who taught me in the past, and I met new friends, too. I appreciate everyone who took the time to come out and support me. I'm blessed beyond words! My hometown library also has a copy of my book. I'm honored. Since the Mississippi River cuts our parish (county) in two, they bought a second copy for the West bank's library, too. I'm honored. 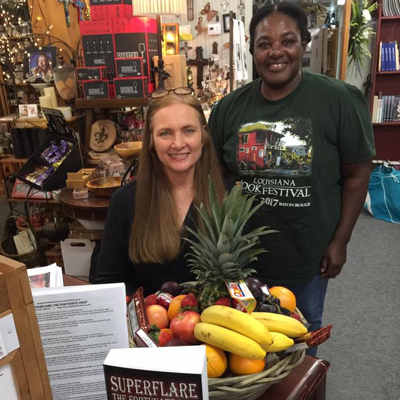 Today I had a book signing at Every Occasion on Prairie Street in Winnsboro, Louisiana and I had a wonderful time. I've got two stories for you. First, a friend of a friend introduced herself to me online a couple of days before the Louisiana State Book Festival. 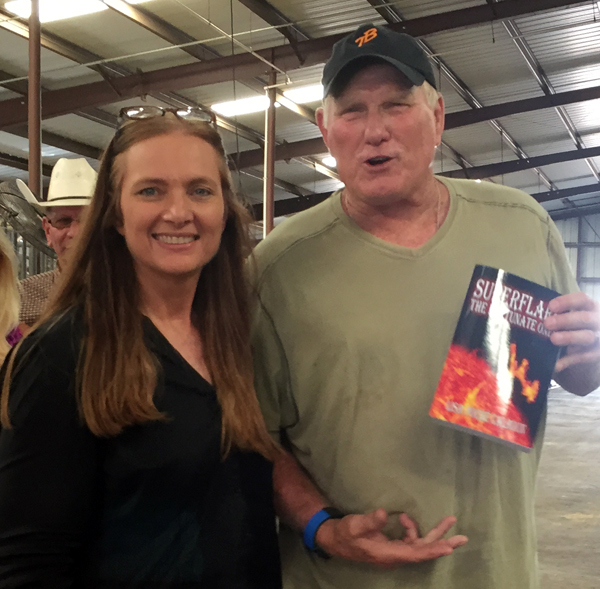 She visited me at the festival this past weekend and bought a copy of Superflare: The Fortunate Ones, but had it signed for a friend. Today, she showed up at my book signing (a full hour from her home.) She said she took a peek inside the book and the story sucked her right in. She bought a copy for herself and gave me this incredible fruit basket she made. Such a kind gesture from a wonderful lady! Thank you Earnestine! Second, the mother of a good friend came to the book signing. Ms. Amaryllis is another wonderful lady, through and through. I enjoyed seeing her again and I had to tell her that I hoped I looked as good as she does when I'm seventy....and she's eighty-five! The Franklin Parish Sun, a newspaper based out of Winnsboro, Louisiana printed this article about me and Superflare: The Fortunate Ones in their October 25, 2017 edition. Here's a snapshot of it. What a day! Today was the Louisiana State Book Festival in downtown Baton Rouge by the State Capitol. The weather was a bit cool for my liking, but I didn't have long to think about it. 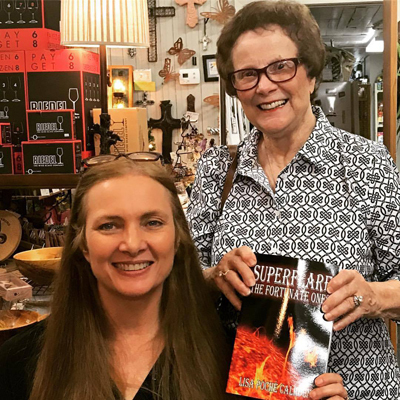 I had a wonderful time talking with people and signing copies of Superflare: The Fortunate Ones. I ended up selling more than twice as many copies as I had dared hope. Here's an image from the book festival's program and a picture my son took. We're set up to offer personalized and signed printed copies of Superflare: The Fortunate Ones through the mail. Purchases are payable through PayPal or with check or money order. We factored everything in and set one flat price. Click here to get yours! It's official! After a conversations with both my husband and my publisher, the decision has been made: I'm not going to write the first Jack Butler book right now because I'm going to give my readers what they've been asking for - a sequel to Superflare: The Fortunate Ones. I already know what's going to be in it and I think it will please my readers. Poor Jack Butler has to move to a back burner, gone but not forgotten. I have a completed Jack Butler "corrupted outlines," effective for me, even if an English teacher would give me an F on it. I'll get to it one day. I have two Superflare: The Fortunate Ones book signings scheduled and I'm sure there are more to come. I've launched the events page on this website so you can keep track of where I'll be making appearances. I'm a people person and I'm looking forward to meeting readers. Check my schedule and come on out! John and I spent a month on the road, late August through late September. We enjoyed the down time, although I sold a lot of copies of Superflare: The Fortunate Ones while we were out there. We went to the AQHA Select World Show in Texas then spent nearly three weeks in southern Colorado. Part of that time was spent camping with bears. Yes, you read that right. I'm not as intimidated by them as I once was. When we tired of their escapades, John and I moved to the Inn in Cuchara. It was lovely, to the point we kept extending our stay. Taos, New Mexico was our next destination. I thought it would be arid, but it's not. It's a beautiful, quaint little mountain town. I loved the architecture in Santa Fe and I could feel the history there. One night we found ourselves in Roswell, New Mexico. It turned out to be a fun place. We had planned to go to Carlsbad because I've always wanted to see the caverns, but we found out the elevator was out. I have physical limitations so we decided we'd go check it out one day once they're back in order. We spent the last weekend of our trip with friends in New Braunfels, Texas before heading home. We had a wonderful time together and I sold out of books (and I had forty with me.) It's official: I like this gig as a novelist. The first month Superflare: The Fortunate Ones has been on the market has been amazing! It has twelve reviews so far, ten on Amazon, one on Barnes & Noble and one on Goodreads, and they're ALL 5 star reviews! I'm on cloud nine. I knew I liked the book, the characters and the story, but it's nice to know that others are liking it, too. Readers have been telling me this novel has a big future. I've been guarded - scared to let myself believe it. Now I think they might be on to something. We're up on the mountain and staying at the Inn in Cuchara, Colorado. This morning I got up and designed a bookmark to give away with Superflare: The Fortunate Ones. I think they came out well! 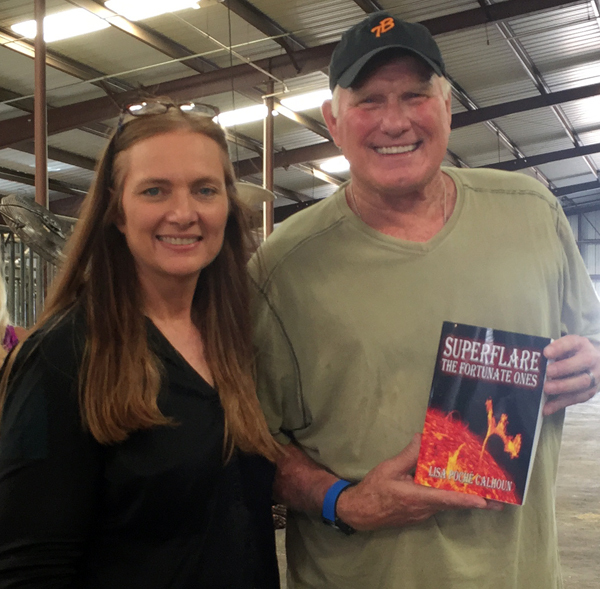 I ran into Terry Bradshaw at a horse show in Amarillo, Texas and gave him a copy of Superflare: The Fortunate Ones for his birthday. He's a kind, personable, humorous person. He and his wife Tammy have both told me they will read it. Now that Superflare: The Fortunate Ones is published, John and I are heading out on vacation. We're going to travel for a few weeks and enjoy each other and life (without my nose stuck in a computer.) We'll often have Wi-Fi and/or data, but there will be times we'll be off-grid, too. The latter will be so relaxing. We truly appreciate good, trustful house sitters that take excellent care of our fur babies (and even send us videos of them) that allow this kind of trip to happen. Superflare: The Fortunate Ones is published! The printed version is available on Create Space now (https://www.createspace.com/6970779) and will be available on Amazon in print and Kindle soon. The Nook version will follow. Superflare: The Fortunate Ones is ready to go. Its Library of Congress Control Number has been applied for and it has been registered with the United States Copyright Office. Once we get the LCCN, it'll get slapped onto the copyright page and the trigger will be pulled. Sometimes I feel like I have one delay after the other, but it'll all be worth it in the end. Look at what I have in my hands today. *excited look* It's the first proof of Superflare: The Fortunate Ones! I was giddy when I opened the box. I felt like a child opening a much anticipated present. I think a joker packed it because I had to dig through a deep stack of crumpled brown paper to get to it. It was funny. I've worked on this book for years - just me sitting with my laptop, typing away, hidden from the world. To hold a printed copy in my hands was surreal. It's a very good day at the Calhoun house today! Since this first proof was ordered, I've already found a few typos and some possession issues with a certain noun. I also awoke this morning knowing I had to add a paragraph. That was done right away, but obviously it's not in this printed version. It'll be in the next one. I expect to order the second proof by the end of the month. I think the next printing will be for sale. Yep, I'm as excited as a little kid! Today I ordered the first proof of Superflare: The Fortunate Ones. My publisher has told me it will take about a week to get here. It will be a very long week. I expect to have one or two more proofs before the novel is published. That pushes the date back into August. The first children's book may have an illustrator. I'm very excited about this! I thoroughly enjoy writing them and this is a major step towards publication. I hope to make a series of these books. The first one is titled "The Missing Lucky Horseshoe." I wrote it with my granddaughter Victoria and it came out cute. Time after time, when I've been asked for my business card, I haven't had one. I talk to people and they ask me for the name of my book, or where they can find more information, where they can order a copy, and often how to pronounce and/or spell Poché. (It's pronounced Poh-shay. Don't Google it without the accent aigu (é) over the E. The accent aigu makes the E sound like a long A.) I should have done this a long time ago, but finally have business cards. Today they came in. I'm very pleased with the front and will tweak the back, with my name and URLs on it, before the next order. If you see me in person, ask me for one. I'll be happy to give it to you! Today has been a big day. 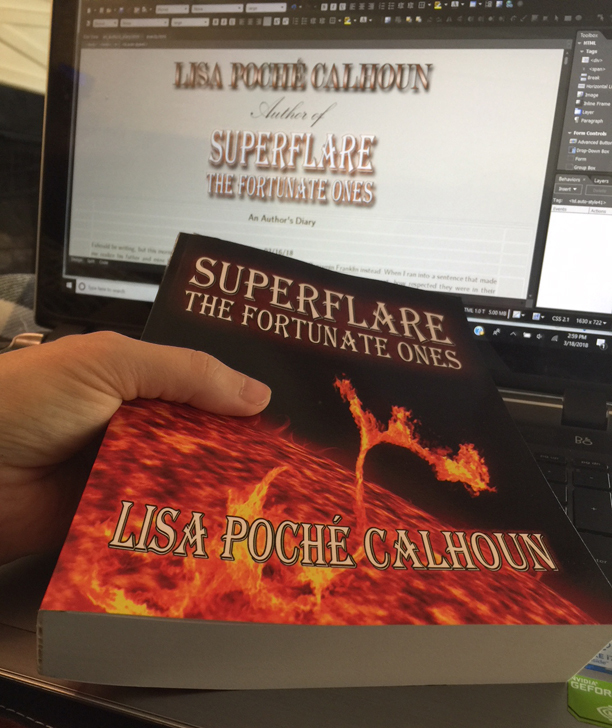 My big baby, Superflare: The Fortunate Ones, has made it home from my editor safely. That was a relief. Then my wonderful editor sent me a picture of her book club and put my book on their reading list! That folks, is it exciting. It also says a lot. I'm one happy author right now! I've heard from my editor and she's finished with Superflare: The Fortunate Ones. She has a hard copy and she has to ship it back to me. I'm not a worrywart, but I sure do hope this doesn't get lost in the mail! I hope to have it by the end of the week. This evening I sat down and wrote Victoria's book. It's adorable. Three animal kids, an elephant, a horse and a cat, are best friends. Their favorite game to play is horseshoes, but one day they lose their lucky horseshoe. Don't worry, they find it because Victoria said it had to have a happy ending. It's written for beginner readers and it's got a good parenting moral to the story. I believe this is going to be the next book I publish, make it, that "we" publish. My granddaughter Victoria is seven years old and often tells me she wants us to write a book together. Today I asked her what she wanted to write about. We had a great conversation where we brainstormed together. The child was enthusiastic and only ten minutes later I knew I had to write this book. Stay tuned! A printed copy of Superflare: The Fortunate Ones is finally in the hands of my editor. Now the patiently waiting starts. I'm excited and anxiously awaiting its return. Once that happens, we'll know exactly how many pages the book will have and we'll be able to tweak the cover to fit perfectly. I'm forcing myself to get my head back into the game, albeit, not totally. Superflare: The Fortunate Ones is scheduled to be with my editor in the next few days. I have to polishing it a little. My loved one was released from the hospital today and is doing well, considering. There's going to be about three months' worth of recovery, but the prognosis is excellent. Please continue to keep us in your prayers. Life has intervened and I've had to turn my attention to a loved one's health. This is going to be an ordeal with a serious hospital stay and recovery. Please keep us in your prayers. The release of Superflare: The Fortunate Ones has been delayed a because of good fortune. In the first chapter, the characters in the book are overhearing a television news report that lets them, and you, my reader, learn about the impending catastrophe that is threatening Earth. A little Space Weather jargon is included in that news report. 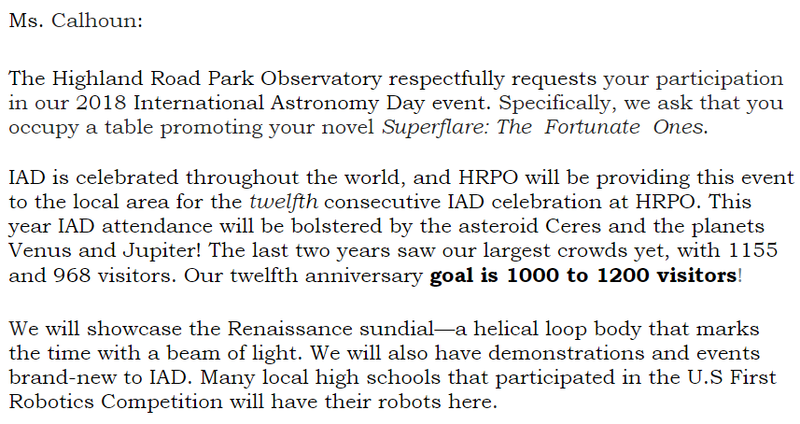 My desire for this book to be accurate led me to look for a Space Weather expert to review the first chapter. Today NASA accepted that chapter for review. I am honored. 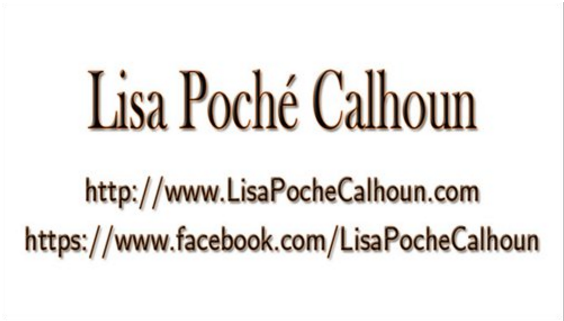 I've signed with Southern Oaks Publishing, LLC. They're a small publisher that fits my needs well. I want to be hands on through the publishing process and in return I'm not going to be standing on the sideline, watching, while giving up a huge percentage of the rights to my books. They're very personable people and I am happy. 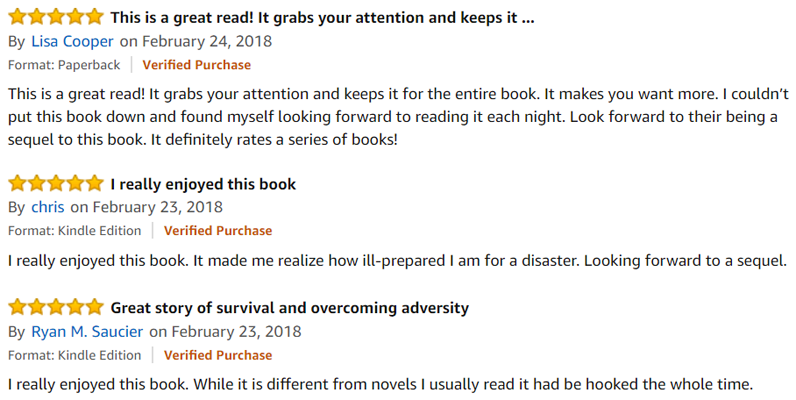 Superflare: The Fortunate Ones has gone out to a handful of select advanced readers and the comments and reviews have been coming in. I knew I liked the book, but to hear them rave over it has me over the moon excited. I can't wait for you all to be able to read it. It's amazing the difference between reading a manuscript on the computer where it was written and reading it on a different device or in print. I've been editing Superflare: The Fortunate Ones on my tablet. I did this novel a big favor by doing this. Now it's time to have some advanced readers catch typos for me. I'm excited to share it with them! I like the book, but it has been my baby for quite a while now. It's a little scary showing it to others. I found the image I want for the cover of Superflare: The Fortunate Ones and bought full rights to it. I think it's going to look good and be eye catching. Now to design the cover completely. Fun, fun! Today I hit a major milestone. I finished the line edit of the Superflare: The Fortunate One's manuscript. I like the book and I like that it tells the whole story, not just part of it. I'm pleased.